Like it or not, the globalization and digitization of the marketplace will continue to influence societies everywhere in the years ahead, with increasing effects on prices, earnings, inequality and the wealth-creation process generally. The effects are not all bad, but for developed economies, in Europe especially, they bring difficult challenges. In particular, the combination of globalization and digitization will continue to hold down earnings, as workers compete with cheaper labour globally and increasing automation throughout most sectors of the economy. These forces also feed the increase in inequality that is wrecking society, because the gains in productivity go only to the owners and financiers (often the same people: the 0.1%, and in particular, the 0.01%). And there’s nothing any one nation can do to prevent these forces from influencing their economy, short of isolating themselves from the rest of the world, North Korea style (and even North Korea is not immune). The two forces are linked. The spread of machines that replace workers, both mechanical and digital, is increasing rapidly, and is already leading to a fall in industrial jobs in the giant factories of China and elsewhere. This is part of the reason for China’s slowdown, as wages there level off. We must remember that cheaper goods must ultimately lead to lower wages – the prices of goods and labour are fundamentally linked, because, deep down, they are the same thing. When we trade in the marketplace, we are ultimately exchanging our labour. Money is a representation of the value added to natural resources by our labour. • Partly to counter this trend, governments have for several years now engaged in the process of quantitative easing – which is basically printing new money to give to banks (in exchange for their holdings of government bonds) – in the hope of boosting lending, and therefore consumer demand, which ought in turn to raise prices. This hasn’t happened to any great extent, mostly because consumers are also workers, and wages for the majority have been falling, so people haven’t wanted more loans that they can’t afford to pay off, especially as interest rates are expected to rise in the next year or so. • Despite the fall in the value of money that would normally result from the above, and also the expected rise in demand as emerging economies continue to grow, most commodity prices have been steady or falling, especially oil, which has halved in price over the last year or so (more here). • Contrary to the forecasts of most economists over the past year or so, the global economy remains sluggish, with high-growth areas such as China slowing down and some regions (Europe, Russia and Japan, for example) verging on further recession. None of these trends fits with past experience, so what’s going on? Why is all this money printing, which devalues the currency and really ought to lead to high inflation, apparently having little effect? My theory is that two major new trends – the globalization of wages and the reduction in real work – are combining with two established trends – inequality and debt – and creating a situation that has never been experienced before, one that will require some radical changes to the current economic system. One could argue that the world is always changing and therefore the situation is always new, and I would agree with this, but economists like to stick with the old models when making their forecasts, relying always on GDP figures and ways to make them grow, even though GDP figures are deeply flawed and becoming more so, as I explain here. Firstly, we have a reduction in prices caused by the globalization and digitization of the marketplace, which in turn is leading to falling wages for the majority of real workers, meaning anyone who has to earn their income (as opposed to the rich, who get richer from their ‘investments’). Second, we have rising inequality, caused primarily by the same thing: Greater productivity, brought about by new technology, cuts industrial jobs and therefore reduces earnings for the majority, while putting more money in the bank accounts of the wealthy owners of business and investment funds. This trend is accelerated by the continuing ‘rationalization’ of industry, in which corporations become ever larger and more global, employing fewer workers and hiding their profits offshore. Third, working-age populations are falling in Europe and Japan especially, but also in Russia and even China. The average age of advanced economies is rising, and older people don’t tend to spend as much on things they don’t need. Fourth, the debasement of money and the reduction in earnings increases the burden of debt, which was already rising anyway, owing to a resumption of the credit bubble and the continuing rise in government borrowing in most advanced nations. So we have a kind of hidden inflation – prices are not rising much in nominal terms and might even be falling, but incomes are also falling, for the majority at least, and future debt repayments will be higher. Also, markets are failing to price things properly – the current drop in the price of oil is purely a result of greater supply and subdued demand, and takes no account of the true value of oil, which for most of the last century has been the biggest source of wealth in this world. What does it mean when the price of basic commodities falls? Prices are always relative – every exchange in the marketplace is basically an exchange of labour; the price of goods and services should reflect the work that goes into them (this rule is obviously not being followed anymore, especially in financial services and so on, but this is part of the problem, as I explain in my book). Money is ultimately a token representation of our labour, or at least, it should be. So if we pay less for goods, we must expect to be paid less for our own labour – falling prices must lead to falling wages. But this simple rule only applies to real workers – those who genuinely ‘earn’ their money – it doesn’t apply to the ‘rentiers’. And if a tiny minority is getting ever richer without even earning their money, the rest of us are being ripped off. Look at it another way: When the West grew wealthy in the ‘golden era’, the three decades following the Second World War, the wealth was created by a massive surge in real industry, led by the US and fuelled by oil. A consumer boom like none before led to a self-feeding cycle of real wealth creation, as a growing industrial workforce filled the new demand for cars, washing machines, televisions and other products of modern society. All this wealth was distributed relatively evenly because the workers were well paid and the middle class was expanding. But this isn’t happening anymore in the advanced economies of the West and Japan, for the reasons mentioned above (the shortage of real, well-paid industrial jobs) and although China has recently undergone a boom that in some ways resembles the West’s golden era (though it happened even more quickly and started from a much lower base), it will be impossible for emerging economies to approach western wealth levels per capita in material terms, because to produce so much stuff for so many people would require more natural resources than the earth can realistically provide, and even ignoring the environmental consequences, industry doesn’t need so many workers anymore, so the wealth wouldn’t be distributed evenly (as we are already finding). The simple truth is this: We must accept a lower level of wealth creation per capita in the West, and the wealth that is produced must be distributed more evenly. Otherwise the majority is going to become ever poorer and the present system of free-market capitalism is going to collapse, and the reason is that, as Marx predicted, the reduction in real industrial labour represents a reduction in the value added to natural resources, and therefore to society as a whole. Marx understood that the competitive element inherent to the capitalist system, which is supposedly one of its great strengths, must lead eventually to a situation whereby industrial owners keep replacing workers with machines, because this cuts their costs and makes industry more ‘efficient’, while creating a ‘reserve army’ of unemployed workers, thus keeping down the price of labour. At the same time, competition between producers means that the profit margin is kept down, so price savings are passed on to the consumer. This is what we have been seeing in the past few decades or so, thanks in part to globalization. Marx foresaw a time when there would be too few well-paid workers to buy the product of all this highly-efficient industry, so the system would self-destruct. I think we are getting very close to this stage. Marx was well ahead of his time, because for most of the twentieth century the workers that lost their jobs in industry found work in the service sector, and for a while this was enough to keep the system ticking over, though in fact it needed a huge injection of credit to help get us to the stage we’re at now – the boom times of the 1990s and early 2000s, leading up to the crash, were fuelled by debt, which in turn means they were based on nothing except future earnings. This false prosperity now has to be paid for, and is one of the reasons we’re getting poorer. So what we find, if we examine all the different trends and work out the links between them, is that a combination of ever-increasing productivity, reduced wages for the majority, rising debt levels and increasing inequality, all of which are linked to the financialization of the economy and the decline of real industry, are leading to the situation that Marx predicted – the self-destruction of the free-market capitalist system. 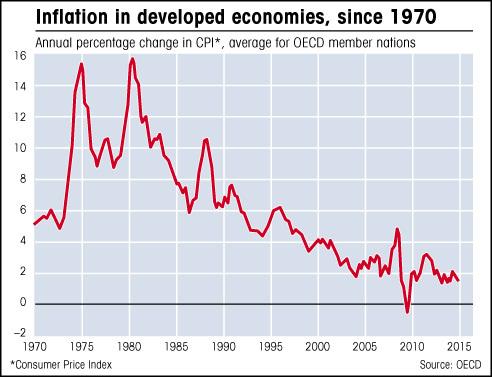 Prices are driven down by intense competition in the global marketplace, as we are seeing now, with this strange situation in which the price of everything – commodities, labour and money – appears to be falling (more here). And a reduction in the amount of real work that is being done in the world is resulting in a reduction in the value added to natural resources, because, as Marx (and Adam Smith before him) understood, labour is the source of all economic value. We are entering a low-work, low-value era. To look at it another way, the wealth-creation process is slowing down because real industry represents a diminishing proportion of economic activity, and this in turn means less value is being added to raw materials. But there’s still a mystery here: If all prices are relative and commodities, labour and money are falling equally, it shouldn’t matter – the falls would be numerical only and our exchanges in the marketplace should balance out. 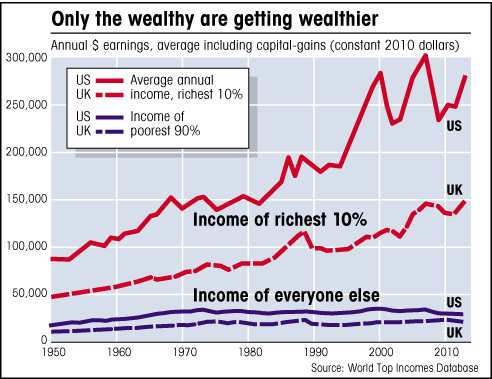 There must be more to it than this, and I think the real issue is inequality; wages are diverging more than ever, with the rich getting ever richer and the rest of us, especially the middle classes of the advanced economies, but also the working classes, getting poorer. Linked to this is the fact that not all prices are steady or falling – asset prices, that is property and company shares, have risen greatly since all that public money was handed to the banks, because these are the things that the rich put their money into. The simple fact is that more and more of the world’s wealth is going to the wealthy, boosting asset prices while at the same time adding to the burden of debt, because banks have far more money than is needed for productive investment (more here). Commodities are scarce resources and prices shouldn’t be falling – this is just a temporary failure by producers to adjust to falling demand. Producers of commodities will be forced to cut supply, and some will go out of business because their costs are greater than their income (as some US fracking companies are now finding). If every exchange in the marketplace is basically an exchange of labour, because the prices of goods and services reflect the work that went into them, then falling prices must lead to falling wages, and vice-versa – you can put this either way, because the relationship between the price you pay for stuff and the price you get for your labour is based on a continuous decision-making process that operates throughout the global marketplace. What this means in practice is that when a global corporation uses Chinese labour to make a product that is sold throughout the world, the price of labour everywhere must begin to converge on the Chinese average, be this lower or higher than the current average rate elsewhere. In recent decades we western consumers have benefitted from the low-wage production of goods, such as computers made in China, while we continued to earn much higher wages than the Chinese. This was a distortion of market fundamentals, brought about primarily by the fact that Chinese workers couldn’t simply move to the West and earn more money, which is what would happen in a truly free-market situation: If workers were always free to move around the world, in the way that money and goods can move around these days, then wage rates would converge towards a global average. But because this is obviously impractical, the process is happening much more slowly. It’s still happening, though – wages are gradually leveling out, which is why, in advanced economies, real workers (as opposed to the 1%) are earning less than they were thirty years ago, in real terms.